Visitors to a Doncaster park have spoken of their horror after police sealed off part of the site for a murder investigation. 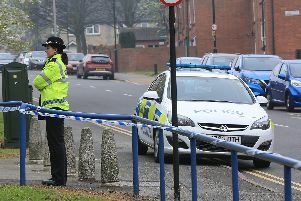 Seventy-year-old Hexthorpe resident Glenyse Cullingworth said: “There have been shootings, stabbings, all sorts in Hexthorpe. “We don’t go out at night, no-one feels safe any more. We used to see the police around, even the horses going through at times but that doesn’t seem to happen now. The Dell Cafe at the edge of the park was quieter than usual which could have been due to the police presence in the park, said cafe assistant Liz Reasbeck, 21. Thorne resident Trevor Taylor, who was in the area on business and had stopped by the cafe, said it was a first visit for him and his wife Judith and he felt a sense of sadness at seeing the police and knowing the reason for their being there. Balby resident David Clayton, 52, who was at the park for the first time, on his disability scooter, said: “I saw all the police and the cordons and thought it looked like a fatality. Very sad in such a beautiful park. “There’s trouble going on all the time these days. There was a murder down my street last week. Laura Smithson, 27, of Balby, who was with her two daughters in the park, said: “We’ve been to visit a friend’s memorial tree in the park today. Joaana Dabrowski, 32, of Balby, said the death was ‘horrible’ and added: “It will make me careful in the future. n Anyone with information should call South Yorkshire Police on 101 quoting incident number 103 of 18 April 2017.